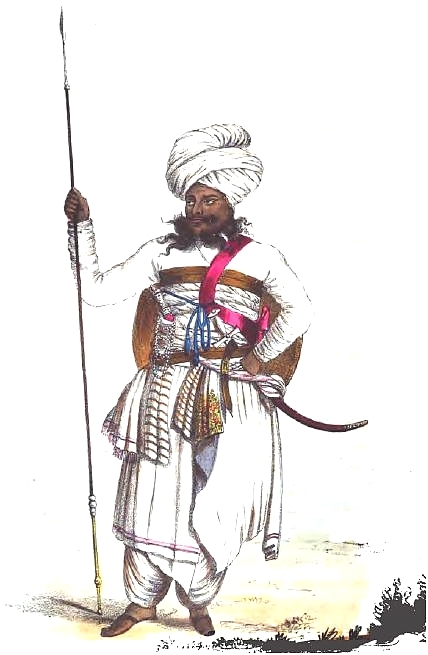 His proposal in 1829 to undertake a journey of exploration through the valley of the Indus River was approved and in 1831 his and Henry Pottinger‘s surveys of the Indus river would prepare the way for a future assault on the Sind to clear a path towards Central Asia. 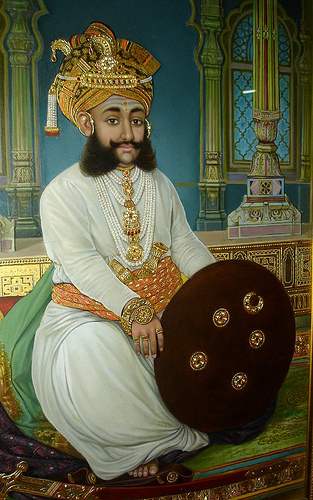 In the same year he arrived in Lahore with a present of horses from King William IV to MaharajaRanjit Singh. 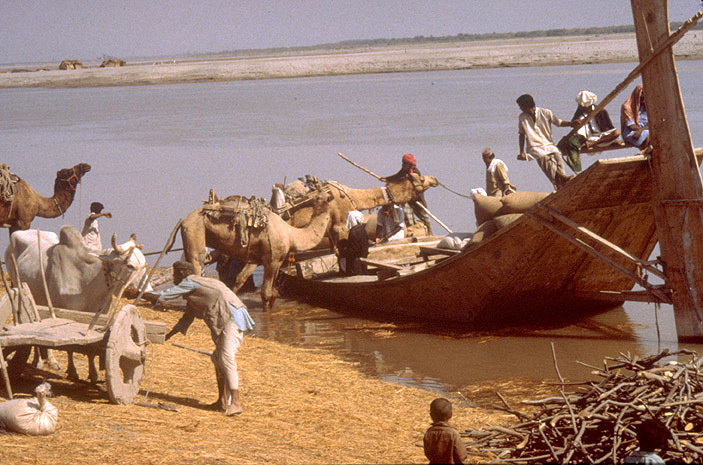 The British claimed that the horses would not survive the overland journey, so they were allowed to transport the horses up the Indus and used the opportunity to secretly survey the river. In the following years, in company with Mohan Lal, his travels continued through Afghanistan across the Hindu Kush to Bukhara (in what is modern Uzbekistan) and Persia. 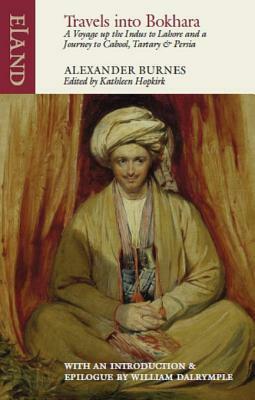 The narrative which he published on his visit to England in 1834 added immensely to contemporary knowledge of these countries, and was one of the most popular books of the time. The book reads like excerpts from Burnes’s personal journal, edited for interest. It is sorely in need of illustrations (or at least, the version on the internet does; perhaps the original had some that weren’t uploaded,) so I’m going to try to add some. It’s been difficult picking which parts to excerpt, so I make no guarantees that I’ve picked the best or most important bits. As usual, I am using “” instead of blockquotes for readability. 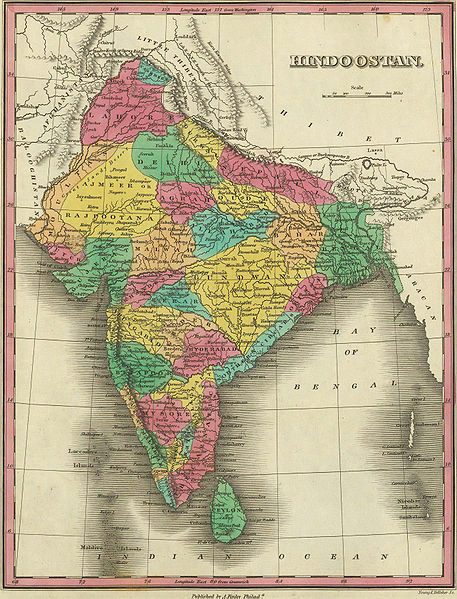 Map of “Hindoostan” from the 1830s. Cutch–now Kutch–is part of the modern district of Gujarat; on the map it is the pink bit on the north-west coast, just south of the main mouths of the Indus. EvX: This is one of those places where ethnonymic shift makes my work difficult. You try Googling “Cotasir” or “Rao Kanoje” and see if you find any information about these places. “Rao” appears to be a noble title, and I have found a “Rao Khengarji” who was the “first Rao of Cutch,” but Wikipedia has no pictures. 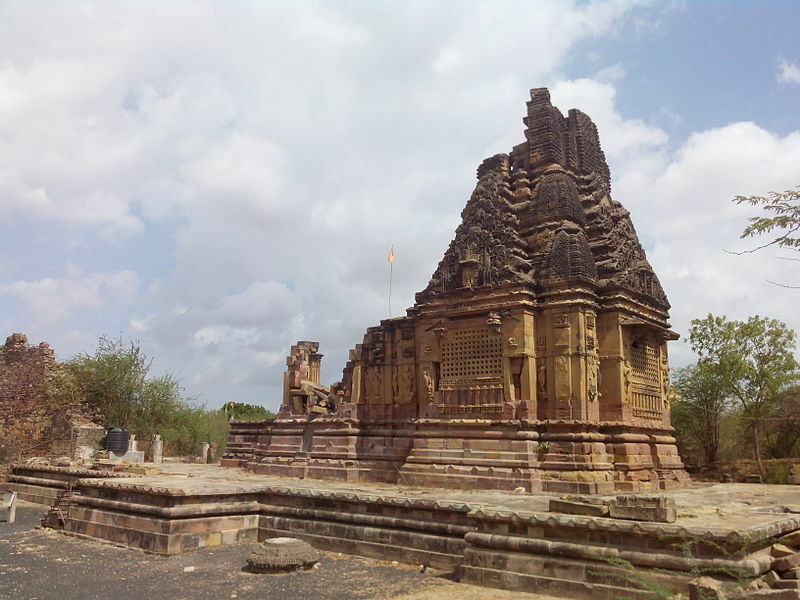 So I have picked a picture of a ruined Hindu temple from the area that might be relevant. *EvX: fritli is likely a word that was incorrectly rendered when the book was digitized–I suspect it means “froth”. EvX: At any rate, they try to get permission to head up the river, but are turned back. EvX: After much negotiation, (including being told that the river is only a few feet deep,) Burnes is finally allowed to take his boats up the Indus. Burnes complains about the duplicitousness of the Ameer of Sind, who was afraid that Burnes was essentially a spy and would use information he gathered about the Indus to help the British invade–which is, of course, exactly what happened. Even if the Ameer was impolite, he was also correct. 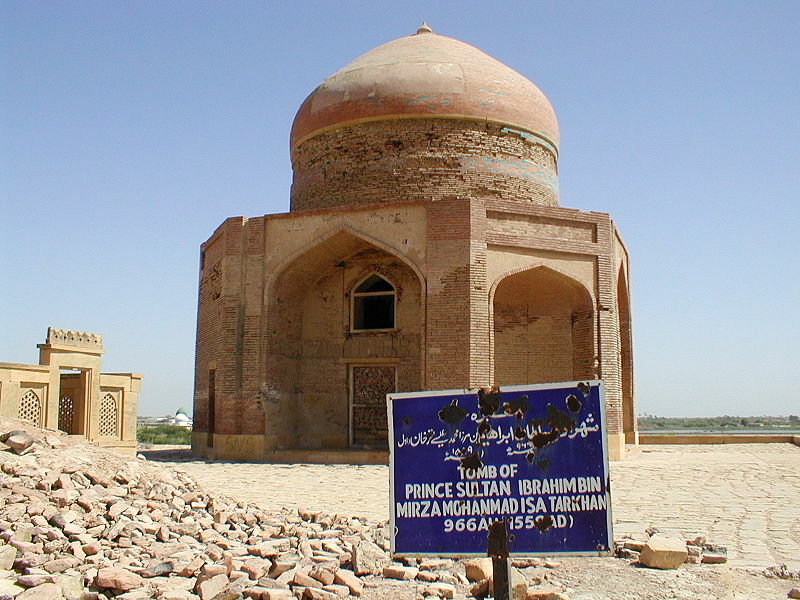 “Sehwun has considerable celebrity and sanctity from the tomb of a holy saint of Khorasan, by name Lal Shah Baz, who was interred here about 600 years ago. 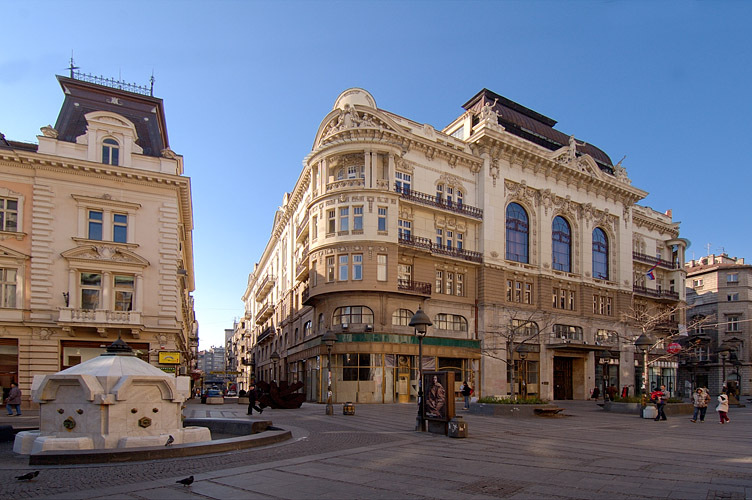 The shrine stands in the centre of the town, and rests under a lofty dome at one end of a quadrangular building, which is handsomely ornamented by blue painted slabs, like Dutch tiles, that give it a rich appearance. A cloth of gold, with two other successive palls of red silk, are suspended over the sepulchre, and on the walls which surround it are inscribed in large Arabic letters the praises of the deceased, and extracts from the Koran. Ostrich eggs, peacocks’ feathers, beads, flowers, &c. complete the furniture of this holy spot; and pigeons, the emblems of peace, are encouraged to perch on the cloths which shade the remains of departed virtue. “The miracles of Lal Shah Baz are endless, if you believe the people. The Indus is subject to his commands, and no vessel dares to pass his shrine without making a propitiatory offering at his tomb. Thousands of pilgrims flock to the consecrated spot, and the monarchs of Cabool and India have often visited the sanctuary. 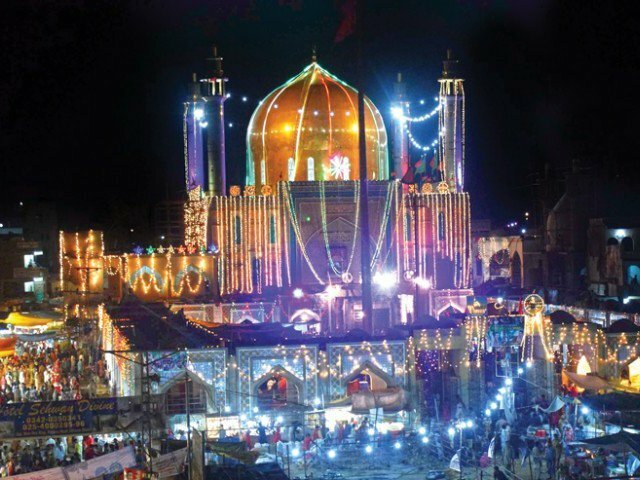 The drums which proclaim the majesty of the saint are a gift from the renowned persecutor Alla-o-deen, who reigned a. d. 1212; and the gate, which is of silver, attests the homage and devotion of a deceased Ameer of Sinde. The needy are daily supplied with food from the charity of the stranger; but the universal bounty has corrupted the manners of the inhabitants, who are a worthless and indolent set of men. EvX: If I lived somewhere that was still 100 degrees out past midnight, I think I’d be “worthless and indolent,” too. Seriously, I think the “people move around more in cooler climates because they aren’t going to die of heat exhaustion” theory of civilization has a lot going for it. I don’t know how humans are supposed to do anything useful in extreme heat. “The Beloochees are a particularly savage race of people, but they are brave barbarians. From childhood they are brought up in arms; and I have seen some of the sons of chiefs who had not attained the age of four or five years strutting about with a shield and a sword of small size, given by the parents to instil into them, at that early period, the relish for war. “This tribe composes but a small portion of the Sindian population; and while they are execrated by the peaceable classes of the community for their imperious conduct, they, on the other hand, hate the princes by whom they are governed. It would be difficult to conceive a more unpopular rule, with all classes of their subjects, than that of the Ameers of Sinde: nor is the feeling disguised ; many a fervent hope did we hear expressed, in every part of the country, that we were the forerunners of conquest, the advance-guard of a conquering army. EvX: so far I haven’t been able to find anything else on the “Khaskelees,” but apparently Pakistan, India, Haiti, and Mauritania rank very high in numbers/percentage of the population currently enslaved. “The ladies were more curious than their husbands. They wear ear-rings of large dimensions, with turquoises suspended or fixed to them; for these stones are of little value in the vicinity of Khorasan. Among the women, I should note the Syudanees, or Bebees, the female descendants of Mahommed: they go about veiled, or rather with a long white robe thrown over their entire body, having netted orifices before the eyes and mouth. They are all beggars, and very vociferous in their demands for alms: one set of them, (for they go about in troops,) when they found I did not readily meet their demands, produced a written paper from the shrine of Lal ShahBaz, at Sehwun, to hasten my charity! Father Manrique, in his journey by the Indus some centuries ago, complains “of the frail fair ones” who molested him by the way. 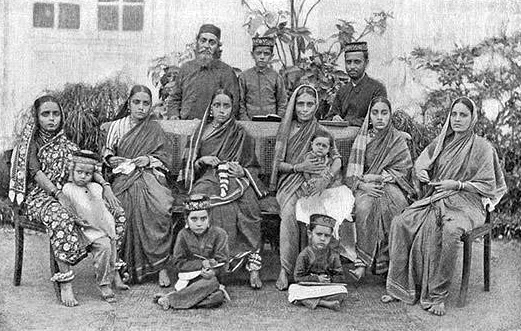 Jewish-Indian (known as Bene-israel) family in Bombay, late 1800s or early 1900s. The history of Jews in Pakistan dates at least as far back as 1839. Various estimates suggest that there were about 1,000 Jews living in Karachi at the beginning of the twentieth century, mostly Bene Israel Jews from Maharashtra, India. 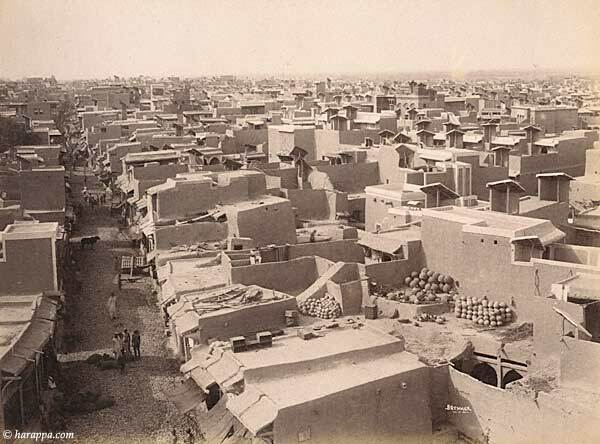 A substantial community lived in Rawalpindi. A smaller community of Jews also lived in Peshawar. The Bene Israel Jews of India were concentrated in Karachi. According to Bene Israel human rights lawyer, Levi M. Sankar, there are no indigenous Jews remaining in Pakistan. Since “Travels into Bokhara” was published in 1834, I think this needs to be revised.Given the trade routes, I think it likely that Jews have been in the area of modern day Pakistan since sometime around the rise and fall of the Persian Empire. I’m going to stop here for now. See you next Friday. Writing well requires, at the very least, two things: clarity and cadence. Clarity is meaning: words mean something. When I write, I do it because I intend to convey some idea from my head to your head, and if I am not clear, then you won’t have any idea what I mean. Cadence is the way the words flow together. People like reading collections of words that sound nice and dislike reading words that jar against each other. Not all writing requires both clarity and cadence. For example, if a surgeon is about to remove a tumor from your lungs, you want the medical documents describing your tumor to be very accurate about its size and location, but you don’t particularly care if the medical documents are pleasant to read. Chemistry textbooks are very exact and thus make it very clear exactly which atoms go into specific molecules, and even go into minute details like which electrons they share, but aren’t known for their artistic prose. By contrast, a romance novel about a hunky doctor who saves the life of a brilliant chemist needs to sound good, but it does not (and really should not,) need to describe exactly where in the chemist’s lungs the exact chemical formula she was working with created the dreaded cancer. Most of my posts focus, in one way or another, on groups of people, and so it is vital that you actually know which group of people I am talking about. But since I am writing for a popular audience and not people who have been forced to buy a textbook, I also try to make the posts pleasant and enjoyable. Ethnonymic creep is the process of ethnonyms–the names for groups of people (and countries)–changing over time. For example, high-class Brits used to write about people called “Hindoos” who lived in a place called “Hindoostan.” Today we call it India and the religious adherents, Hindus. 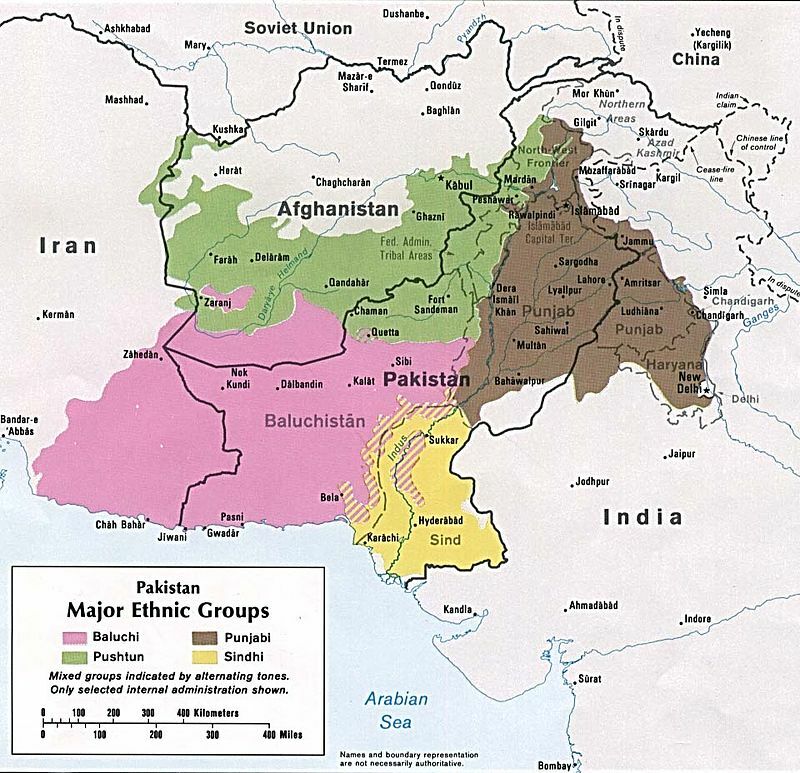 (And just to confuse things, while “-stan” comes from an Indo-European root and means “land of,” eg, “land of the Hindoos,” and is usually preceded by the name of the ethnic group that lives in the area, eg, Balochistan is the land of the Balochis; Afghanistan is the land of the Afghans; “Pakistan” does not actually refer to an ethnic group at all but instead means something like “Pure land” or “Land of the Pure,” [I’m not sure which.] Of course it is totally valid to describe the kind of land one’s country is, mountainous or forested or pleasant or whathaveyou, but this does lead to the confusion that there must be an ethnic group it refers to. Not only is there not an ethnic group, but the obvious shortened form of Pakistani is a slur, so you’d better keep it all straight. But “Gypsy” is not a slur in English (at least not American English.) Americans don’t really know much about Gypsies, are barely aware that any Gypsies live in America, and so they don’t put much effort into insulting them. The idea that “Gypsy” is a slur and therefore has to be replaced with the linguistically unclear (and problematic, because it does not pluralize and adjectivize like an English word,) “Rom”/”Roma,” is simply untrue. Moreover, unlike Hindoo/Hindu, Rom is not an obvious variant of Gypsy. Many people, encountering “Roma” for the first time, will have no idea that this is supposed to mean “Gypsy,” nor do they deserve to be castigated as racists for using an “ethnic slur” that they have never heard anyone use as a slur. Similarly for the switch from “Eskimo” to “Inuit.” Perhaps Eskimo–or Esquimaux, as I have also seen it–means something insulting in the local language of the Eskimo, but it certainly means nothing insulting in English. The Gypsies are actually known for a propensity toward theft, a reputation they would like to leave behind–indeed, one may cynically suspect that avoiding association with the actual Gypsy over-representation among criminals is the true motivation behind the shift–but the Eskimo are known only for building igloos, a custom the rest of the world finds delightful. And to complicate matters even worse, while the Eskimo of Canada prefer to be called Inuit, the Eskimo of Alaska prefer to be called Eskimo, and think this whole “Inuit” thing is being imposed on them by those Canadians. If you want to be extra safe, call the ones from Alaska the “Yupik,” if you can remember that. Oh, and now they’re Sami, not Lapps or Laplanders, even though “Lapp” was, again, never a slur in English (at least not American English,) because why on earth would we insult some random ethnic group from some other country. And the children’s book “Polar Bears Past Bedtime” describes the Eskimo as “Arctic Peoples.” Ugh. The Democrats have lately taken to pronouncing “Muslim” as “Mooslim.” Maybe that is closer to how Muslims pronounce the word, (given that there are countries with significant Muslim populations stretching from Nigeria to Bosnia to Indonesia, I doubt there is any standardized pronunciation anymore than “Christian” is pronounced the same in English, Russian, and Ethiopian,) but to me it just sounds like “moose,” and it doesn’t seem superior to me to call them after a large deer. “Muslim” is itself a replacement for Mohammedan, which I encounter frequently in older scholarly works. (I don’t really read many older non-scholarly works, to be honest.) From the standpoint of utility, “Mohammedan” is a better term. “Muslim” tells me only that these people have something to do with moose, whereas “Mohammedan” tells me that they have something to do with Mohammad, a famous historical figure. 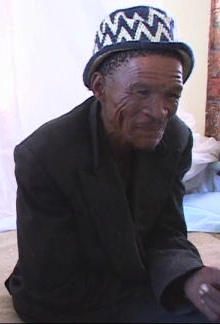 Meanwhile, the Bushmen actually prefer being called Bushmen, but Bushmen sounds vaguely improper so people have taken to calling the Khoi-San people (or Khoisan or whatever,) even though I think they have historically had rather violent conflicts with the Khoi people (Bushmen I believe speak the San languages,) and “San” is itself vaguely pejorative. The indigenous peoples of the US are also linguistically problematic; last time I checked, a small majority of them preferred the term “Indian” as a collective noun, because “Native American” sounds like a label you put on artifacts at a museum, not a group of people, and they’ve been called Indians for hundreds of years, so they’re pretty used to it. Unfortunately, Indians are also the group formerly known as Hindoos or Hindoostanis, who now live in the US in large enough numbers that even if I use a somewhat clunky term like “American Indians,” it’s not entirely clear without context that I’m referring to indigenous Americans and not “Indian Americans,” ethnic people from India who now live in America. Du Bois also wrote The Souls of Black Folk. I could go on–how the term “purple” as referent to Australian Aborigines has disappeared (when I was a kid, I really did think that people came in a rainbow of crayon colors,) how “yellow” is no longer an acceptable skin descriptor, even though people in China actually use the term for themselves; the disuse of “Mongoloid” for the third great race of man; and other varied changes in ethnonyms–but you get the gist. Nor do regular words seem to do this; as far as I can tell, this annoying turnover is limited almost exclusively to ethnonyms and terms for other groups of people (like “cripples” becoming “handicapped,” “disabled,” or “differently-abled,) and is driven largely by the twin forces of wanting to show that you’re worldly enough to know the latest, fanciest pronunciations (“Belgrade” or “Beograd”? “Chilly” or “Chill-eh?”) and wanting to signal that you’re not racist/homophobic. One of the effects of constant ethnymic creep (other than making people get into stupid fights on the internet with each other over terminology,) is to make information less accessible by making it harder for people to know what others are talking about and by making them more likely to dismiss sources that don’t use the newest ethnonym. In some cases, I think this is intentional. Making information about groups of people less accessible is, of course, the opposite of my intentions. 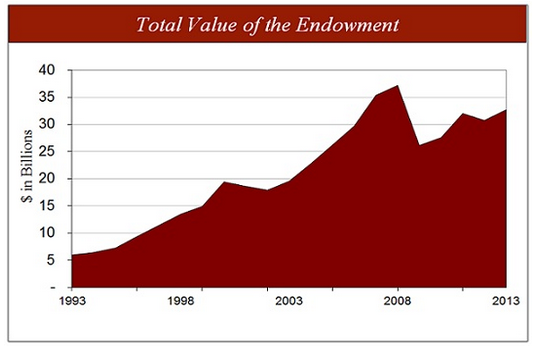 Isn’t this a great graphic? My hat’s off to the Estonians. Beautiful work. It might just be the sleep dep + lots of coffee talking, but I am so excited about this. n Papua New Guinea, Dr. Metspalu and his colleagues found, 98 percent of each person’s DNA can be traced to that single migration from Africa. But the other 2 percent seemed to be much older. Obviously, in science, replication and caution are key. Don’t get too excited. These results might turn out to be wrong–sometimes samples get contaminated or data coded incorrectly and we get results that turn out to be completely wrong. And, okay, this isn’t really “huge” in the grand scheme of things–we’re only talking about 2% of Papuans’ ancestors, not, like, 40% of them. But it does explain all of those anomalously old findings. The Red Deer Cave People were the most recently known prehistoric Hominin population that did not look like modern humans. Fossils dated to between 14,500 and 11,500 years old were found in Red Deer Cave and Longlin Cave in China. Having a mix of archaic and modern features, they are (tentatively) thought to be a separate species of humans that persisted until recent times and became extinct without contributing to the gene pool of modern humans. 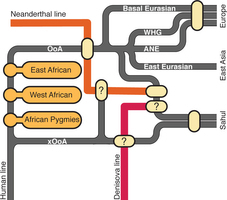 We estimate that Aboriginal Australians and Papuans diverged from Eurasians 51–72 kya, following a single out-of-Africa dispersal, and subsequently admixed with archaic populations. … Papuan and Aboriginal Australian ancestors diversified 25–40 thousand years ago (kya), suggesting pre-Holocene population structure in the ancient continent of Sahul (Australia, New Guinea and Tasmania). However, all of the studied Aboriginal Australians descend from a single founding population that differentiated ~10–32 kya. We infer a population expansion in northeast Australia during the Holocene epoch (past 10,000 years) associated with limited gene flow from this region to the rest of Australia, consistent with the spread of the Pama–Nyungan languages. (kya = thousand years ago). So about 10-32 thousand years ago, one group of Australians conquered all of the other groups of Australians. Three things going on here. 1. The group from the north conquered the group from the south, raped their women, and imposed their language. They were able to do this because they had better weapons (“backed edge blades.”) But the group from the north was not very big, and so did not leave a very big genetic signature. 3. Intellectuals are kind of naive. 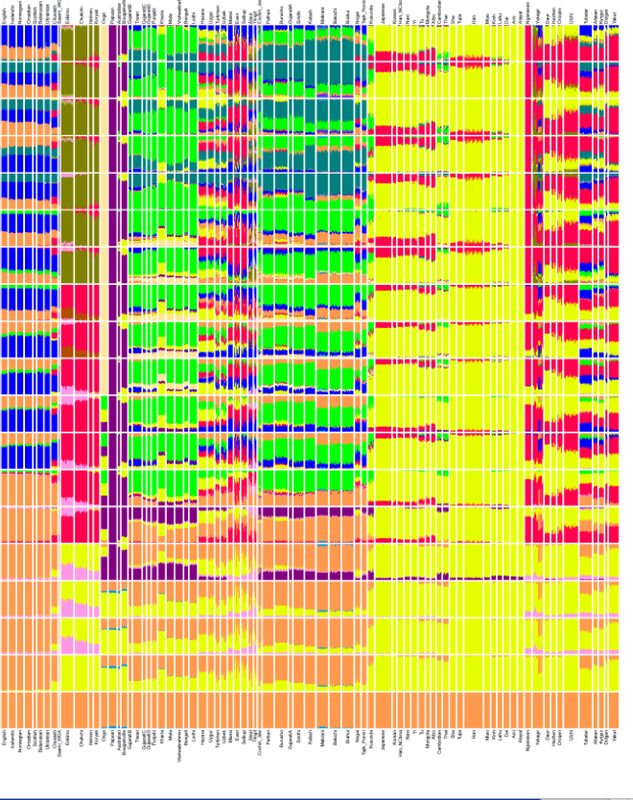 The other really interesting thing here is that the linguistics team came to their conclusions by feeding a big database of Aboriginal words into a computer and having it run similar algorithms to the ones geneticists use for examining human ancestry (see the lovely graphics above.) I’ve been wondering for a long time why they don’t just do this, and am excited that they finally are. Now please someone put all of the languages + reconstructed proto-langauges into the computer and find the most likely trees. You may wish to read the whole thing there. The short response is that I basically agree with the bit quoted, and I suspect that virtually everyone who takes IQ tests seriously does as well. We all know that if you come into an IQ test hungover, sick, and desperately needing to pee, you’ll do worse than if you’re well-rested, well-fed, and feeling fine. That time I fell asleep during finals? The ability to sit still and concentrate is especially variable in small children–little boys are especially notorious for preferring to run and play instead of sit at a desk and solve problems. 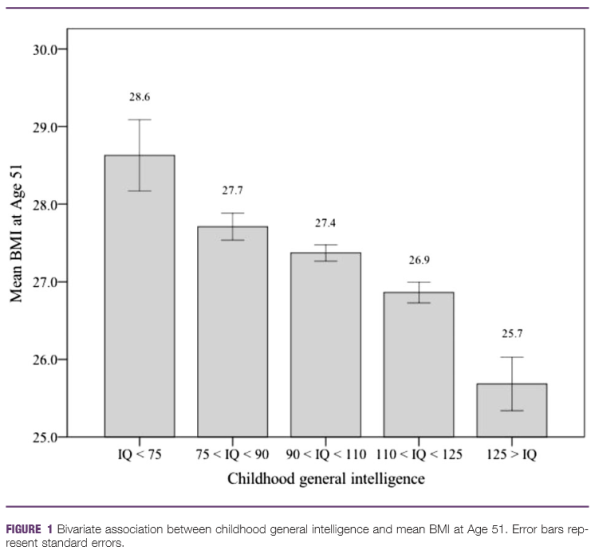 And while real IQ tests (as opposed to the SAT) have been designed not to hinge on whether or not a student has learned a particular word or fact, the effects of environmental “enrichment” such as better schools or high-IQ adoptive parents do show up in children’s test scores–but fade away as children grow up. There’s a very sensible reason for this. I am reminded here of an experiment I read about some years ago: infants (probably about one year old) were divided into two groups, and one group was taught how to climb the stairs. Six months later, the special-instruction group was still better at stair-climbing than the no-instruction group. But two years later, both groups of children were equally skilled at stair-climbing. There is only so good anyone will ever get at stair-climbing, after all, and after two years of practice, everyone is about equally talented. The mistake some people (not Chuancey Tinker) make is to jump from “IQ tests are not 100% reliable” to “IQ tests are meaningless.” Life is complicated, and people like to sort it into neat little packages. Friend or foe, right or wrong. 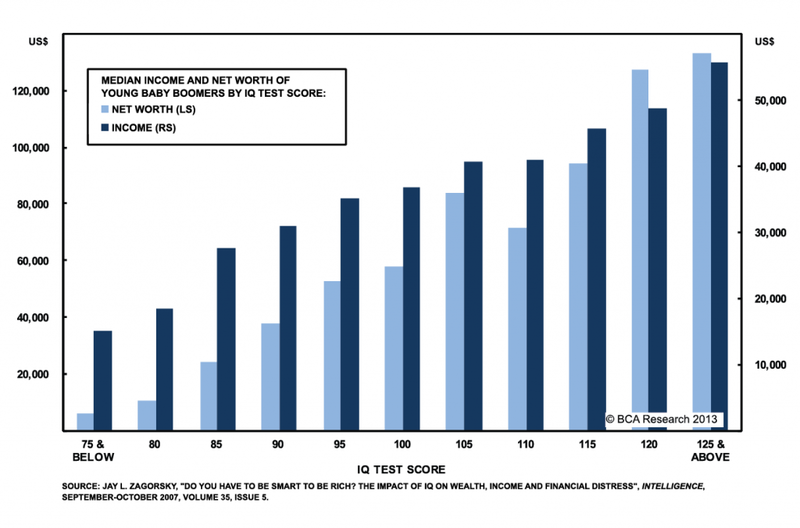 And while single IQ test is insufficient to judge an entire person, the results of multiple IQ tests are fairly reliable–and if we aggregate our results over multiple people, we get even better results. As with all data, more tests + more people => random incorrect data matters less. At 5 years old, “genetic” factors, (the diamond and thick lines) are less important than “shared environment.” Shared environment=parenting and teachers. That is, at the age of 5, a pair of identical twins who were adopted by two different families will have IQ scores that look more like their adoptive parents’ IQ scores than their genetic relatives’ IQ scores. Like the babies taught to climb stairs before their peers, the kids whose parents have been working hard to teach them their ABCs score better than kids whose parents haven’t. By the age of 7, however, this parenting effect has become less important than genetics. This means that those adopted kids are now starting to have IQ scores more similar to their biological relatives than to their adoptive relatives. Like the kids from the stair-climbing experiment, their scores are now more based on their genetic abilities (some kids have better balance and coordination, resulting in better stair-climbing) than on whatever their parents are doing with them. 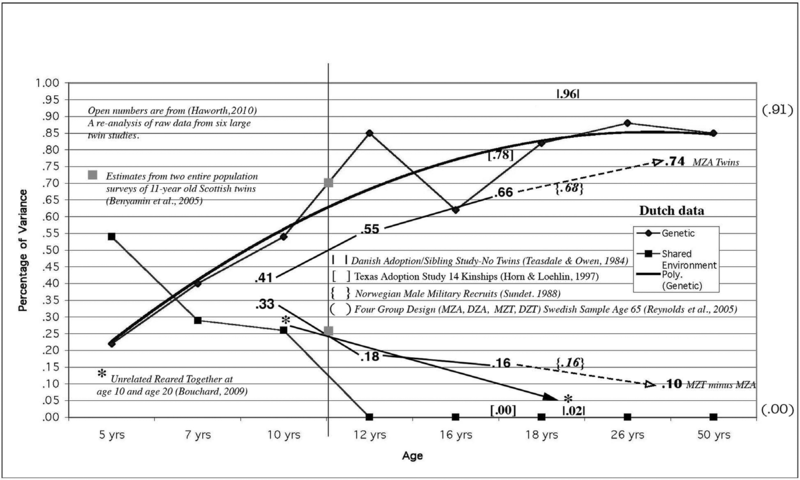 By the age of 12, the effects of parenting drop to around 0. At this point, it’s all up to the kid. Of course, adoption studies are not perfect–adoptive parents are not randomly selected and have to go through various hoops to prove that they will be decent parents, and so tend not to be the kinds of people who lock their children in closets or refuse to feed them. I am sure this kind of parenting does terrible things to IQ, but there is no ethical way to design a randomized study to test them. Thankfully, the % of children subject to such abysmal parenting is very low. Within the normal range of parenting practices, parenting doesn’t appear to have much (if any) effect on adult IQ. The point of all this is that what I think Chauncey means by “learning,” that is, advantages some students have over others because they’ve learned a particular fact or method before the others do, does appear to have an effect on childhood IQ scores, but this effect fades with age. I think Pumpkin Person is fond of saying that life is the ultimate IQ test. Map of IQ by country. Source: Wikipedia. 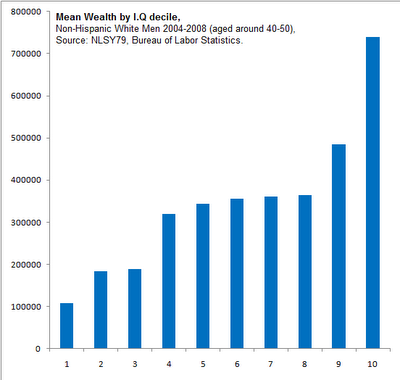 There’s a simple reason why this correlation holds despite lazy and non-money-oriented smart people: there are also lazy and non-money-oriented dumb people, and lazy smart people tend to make more money and make better long-term financial decisions than lazy dumb people. 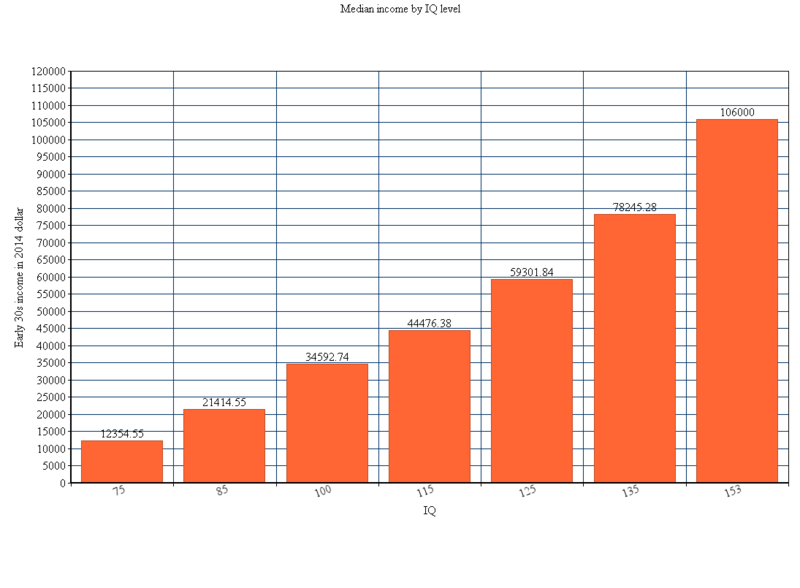 Note that none of these graphs are the result of a single test. A single test would, indeed, be useless. Even China, an organized polity with excellent record-keeping, ship-making, and map-making skills going back centuries, does not show Australia on its maps (at least not on any map I’ve found,) until 1602. 1602 is still before 1606, but we will discuss these Chinese maps in a minute. 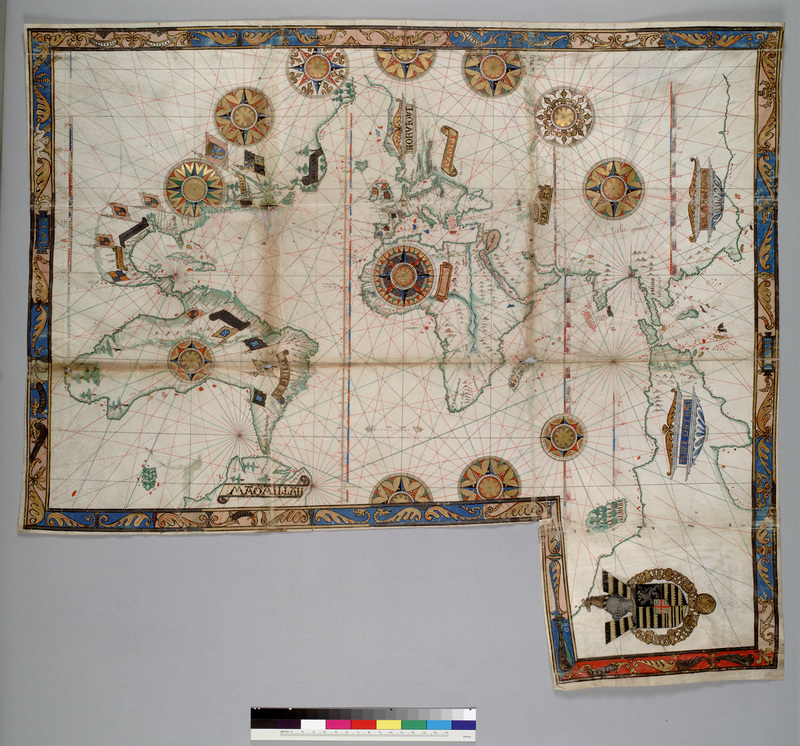 Portugal had a policy, in the 1500s, of treating its nautical maps as official state secrets. French spies, therefore, went and bribed Portuguese map-makers into sharing their secrets, the results of which are probably the Dieppe maps, due to their many Portuguese and French labels, indicating French cartographers working off Portuguese originals. All of which raises the question of WHO was exploring Australia in the early 1500s. Was it the Portuguese? If so, they’ve done an excellent job (a few bribed cartographers aside,) in keeping it secret. Unlike the fabled Viking settlement in Vinland, we have yet to discover any hard evidence, such as Portuguese DNA or artifacts in Australia, that would confirm an early Portuguese presence. I find it highly unlikely that the Dieppe cartographers suddenly decided to turn “Jave la Grande” into a great big landmass in a spot where no prior European maps had ever shown land, and happened, totally by accident, to position it where there actually is a continent. That leaves the question of how Australia got on the charts. Just as the French got their information from the Portuguese, the Portuguese may have gotten their information, in turn, from someone else, like the Chinese, Indonesians, or Islamic mariners. The Wikipedia page on Islamic geography is inadequate for me to draw any conclusions from it. As I mentioned earlier, the first Chinese maps (that I know of) to show Australia are from 1602, after the Dieppe maps. The Kunyu Wanguo Quantu were created by Matteo Ricci, an Italian Jesuit missionary. The Kunyu Wanguo Quantu combines, for the first time, the geographic knowledge of Europe and China. Ricci got to China by hopping aboard a Portuguese vessel, which dropped him off at their colony in Goa. From there he traveled to Macau, and then to Beijing and the Forbidden City (though he never met the Emperor.) So I think it highly likely that Ricci had access to (or knowledge of) Portuguese maps/discoveries, or the Dieppe maps themselves. 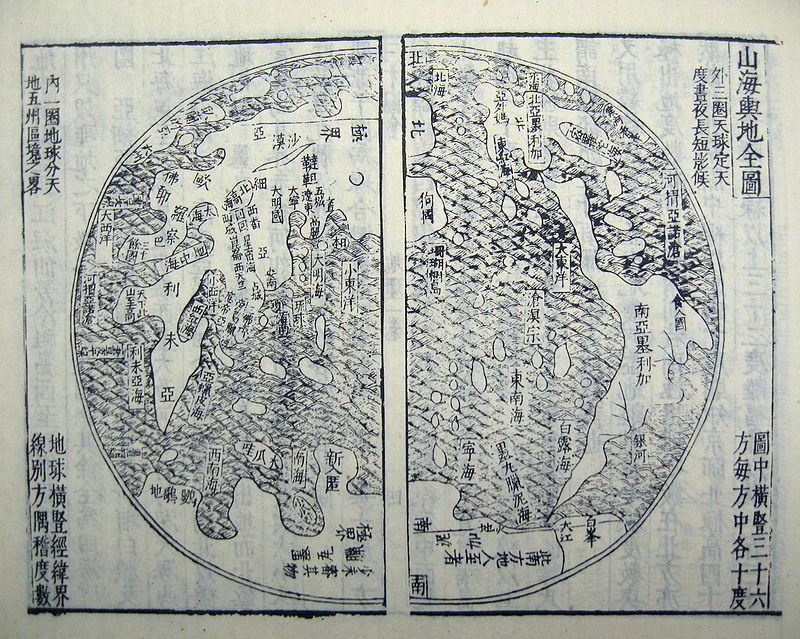 I suspect that Ricci’s knowledge of Australia did not come from Chinese sources, because the Chinese world map Shanhai Yudi Quantu, (1609,) though inspired by Ricci’s work, does not show Australia. In 1944, a small number of copper coins with Arabic inscriptions were discovered on a beach in Jensen Bay on Marchinbar Island, part of the Wessel Islands of the Northern Territory. These coins were later identified as from the Kilwa Sultanate of east Africa. Only one such coin had ever previously been found outside east Africa (unearthed during an excavation in Oman). There is, however, a potentially more mundane explanation for this odd landmass: it could just be South America. 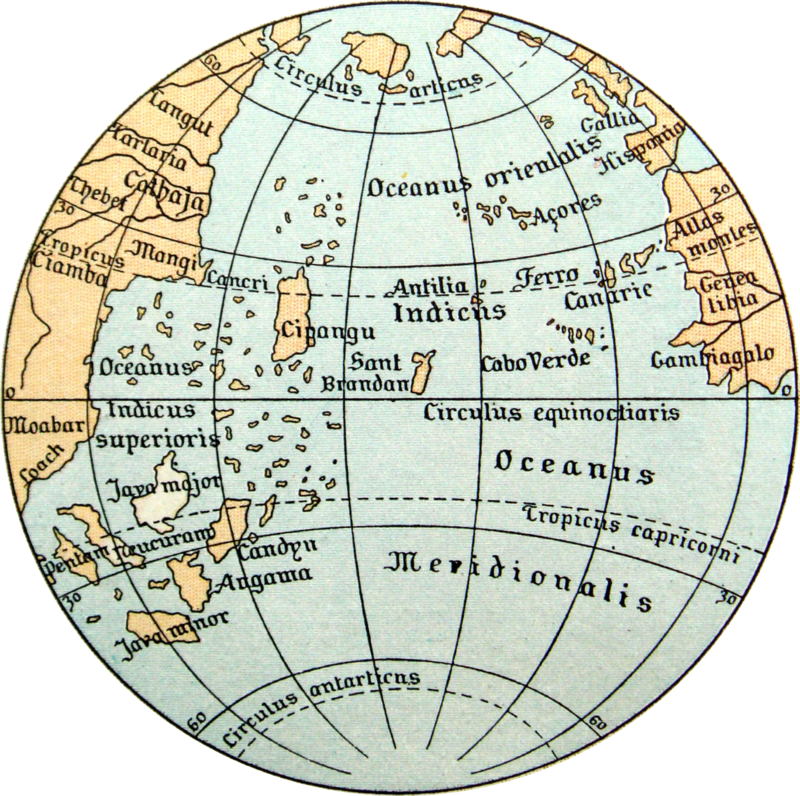 To European mapmakers of the late 14 and early 1500s, it was not at all clear that Columbus had discovered the edge of a new continent, rather than some islands off the coast of Asia–hence Ruysch’s 1507 map that show Massachusetts merging into China. I think it possible, therefore, that the Dieppe map makers had before them one map which showed the coast of Brazil as an island near Indonesia, and a second map showed it as part of a continent in between Europe and Asia, and simply recorded both on their combined map. Personally, I think the shape of Jave la Grande looks more like South America than Australia, but perhaps if I could read thee maps or examine them in more detail, I would revise that assessment. This would be a case of the Dieppe map makers getting lucky, not unheard of phenomenon. Medieval Europeans believed, for example, in a mythical “fourth continent” located on the other side of the world, called fanciful names like “the antipodes” (“the backwards feet,” a reference to the amusing idea that people on the other side of the world are standing upside down relative to oneself–again, proof that Europeans well before Columbus knew the Earth is round;) or less fancifully, “terra australis,” “southern land.” Since the Bible commands Christ’s disciples to spread his Gospel to “the four corners of the Earth,” Medieval mapmakers, faced with only 3 continents, figured there had to be a fourth. But since philosophical opinions conflicted regarding this fourth continent, it was not always included on maps. The European age of exploration pushed the borders of this fourth continent increasingly southward, as the vast expanse of the Pacific, Indian, and Atlantic oceans were found not to harbor it, until it was restricted to the area south of South America. But here folks got lucky, and spotted an actual continent right where their maps said there ought to be one. 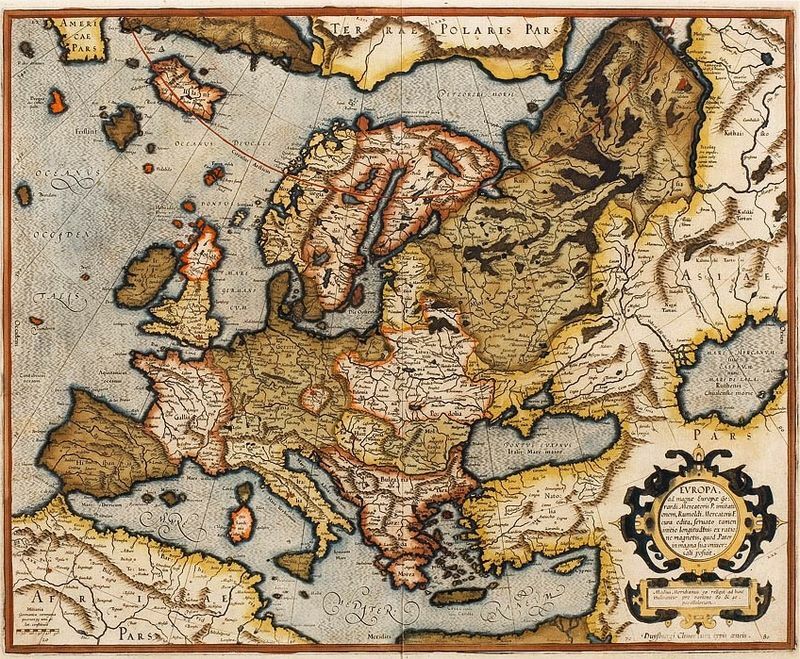 Likewise, when Australia first showed up on European maps, it was supposed to be a northern promontory of this most southerly land, and so depicted. Thus the name “Terra Australis” came to be inscribed on this territory. So we are still left with a mystery: did someone actually map Australia before the Dutch, or did the Dieppe map makers just get lucky? 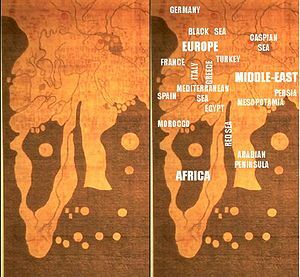 Old maps are full of curiosities, like completely mythical islands (eg, Hy-Brasil,) land masses radically out of place or duplicated, and massive changes in scale from one side to the other. People generally made good maps of their local areas fairly early on–the Chinese have some excellent early early maps, for example. 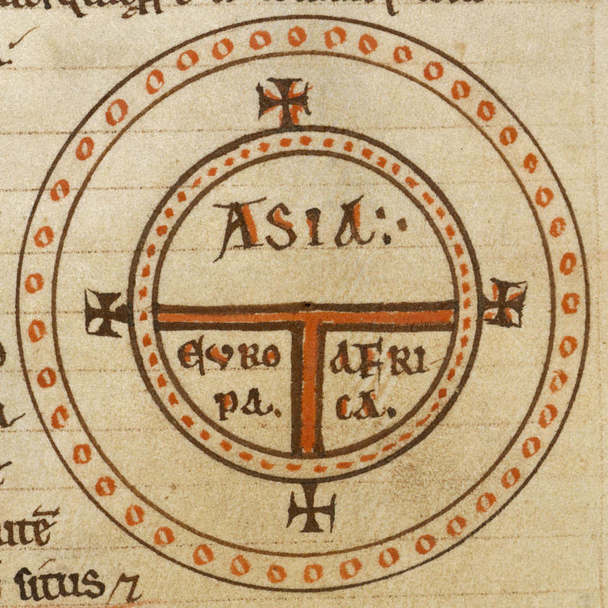 But beyond the immediate and local, maps quickly became less detailed and more stylized, as in this “T-O” style medieval map, which obviously is not even trying to be accurate, but to express a theologic point. Since early sailors did not usually strike out over long stretches of open water, but headed to nearby ports or islands a few days’ sail away, I suspect that most early sea charts put a great deal of effort into describing the relevant rocky shoals to avoid and safe harbors to take advantage of, and not so much effort into describing the broad curve of continental coastlines. 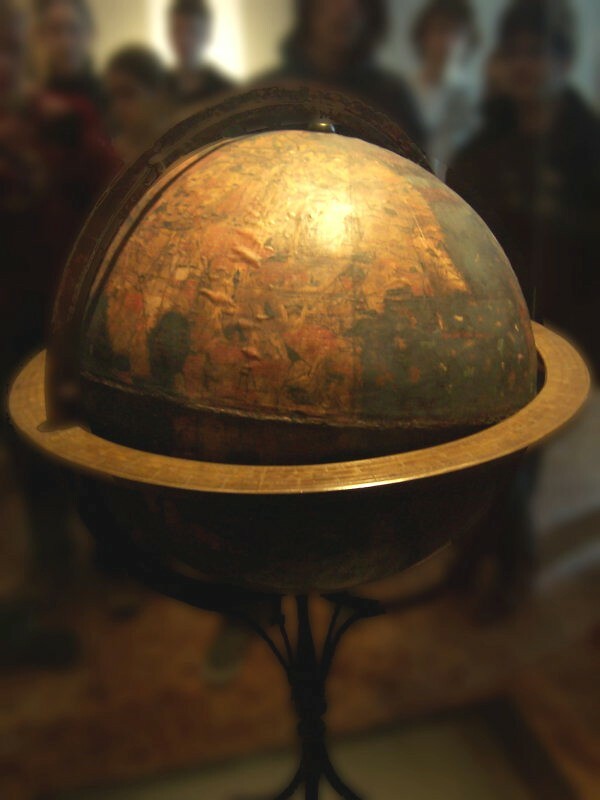 But there is no easy, low-tech way to determine longitude, your east-west position on the Earth’s surface. Longitude is not a huge deal when island-hopping short distances, but it becomes a huge deal once you’re undertaking multi-week trans-Atlantic or trans-Pacific voyages, where a storm can suddenly blow you days off course and you end up crashing into rocks you didn’t know were there. For example, in 1707, four British Navy warships were pushed off course by storms off the coast of England and crashed into the Isles of Scilly. 1,550 sailors drowned, prompting the British government to offer a 20,000 pound prize for anyone who could figure out a way to accurately determine longitude at sea. The lack of knowledge and inability to make good measurements rendered even the best early maps of the world objectively terrible. 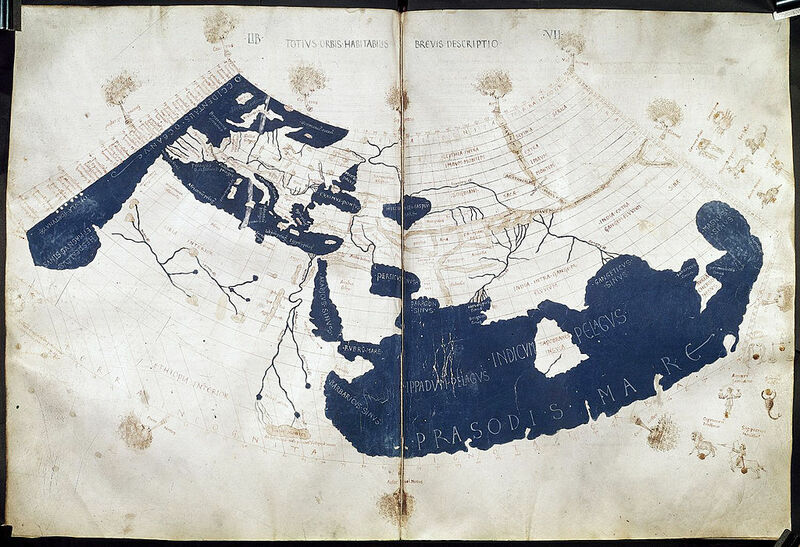 Here we have a reconstruction of Ptolemey’s world map, based on the geographical knowledge of AD 150, and Al Idrisi’s map drawn for Roger II of Sicily in 1154. Idrisi did a good job depicting Sicily, but nearby Italy is a complete mess, and he duplicates Ptolemy’s mistake of essentially depicting India as a big island (actually, probably confusion between the size of India vs. the size of Sri Lanka,) and Ptolemy’s complete confusion about the angle of Africa’s east coast. On the other side of the world, Chinese and Korean maps show a similar pattern. 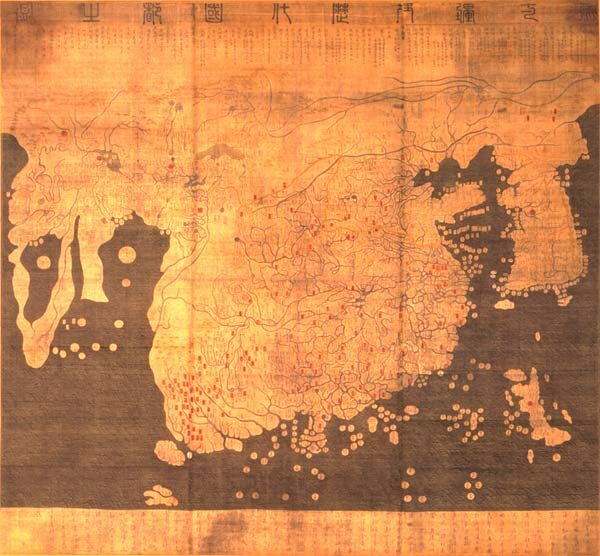 The Gangnido (aka Kangnido,) map of 1402, created in Korea, shows Korea, China, the Arabian Peninsula, and Africa. I think India is very slightly projecting from the lower-left side of the China blob, with Sri Lanka a bit more properly sized than on Ptolemy’s map. The Gangnido map is based on an earlier Chinese map, the Da Ming Hun Yi Tu of 1398, which is very similar, but might have the Malay Peninsula. But the total lack of a Malay peninsula is really confusing, as I assume anyone traveling from China to India would be quite are of this enormous detour in their way. It’s like drawing a map of Europe and leaving off Spain. These maps show the difficulties of trying to compile one map out of many, as your maps may use vastly different scales. The Gangnido and Da Ming Hun Yi Tu maps combine information compiled from Chinese, Korean, Japanese, Mongolian (the Mongol empire collected maps from all of its conquered nations,) and Islamic sources, eg, the voyages of Ibn Battuta. 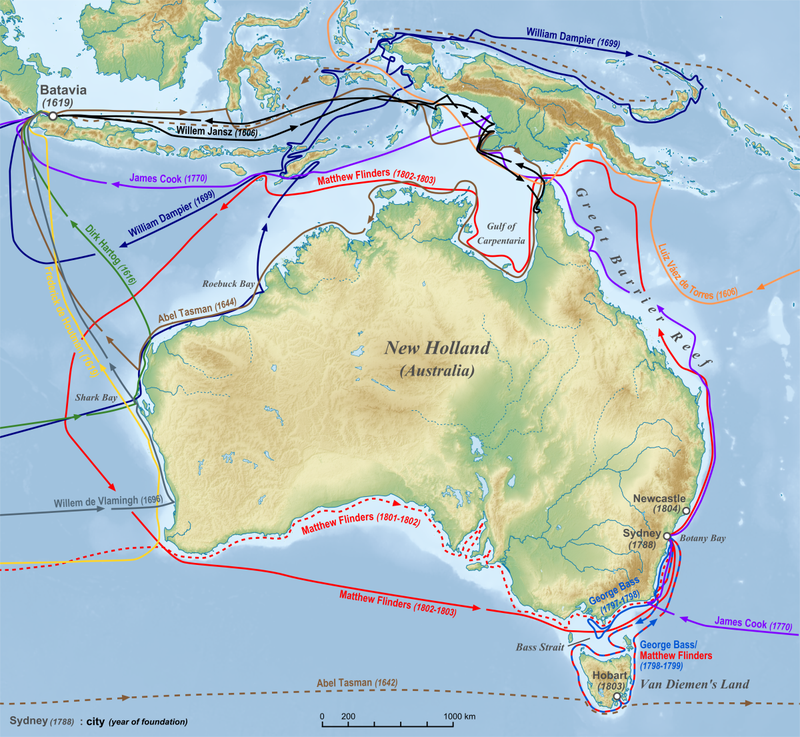 I have noticed that no matter which explorer of south Asia we are talking about, whether Ibn Battuta, Marco Polo, Zheng He, or the Polynesians, none of them seem to have made it to Australia. 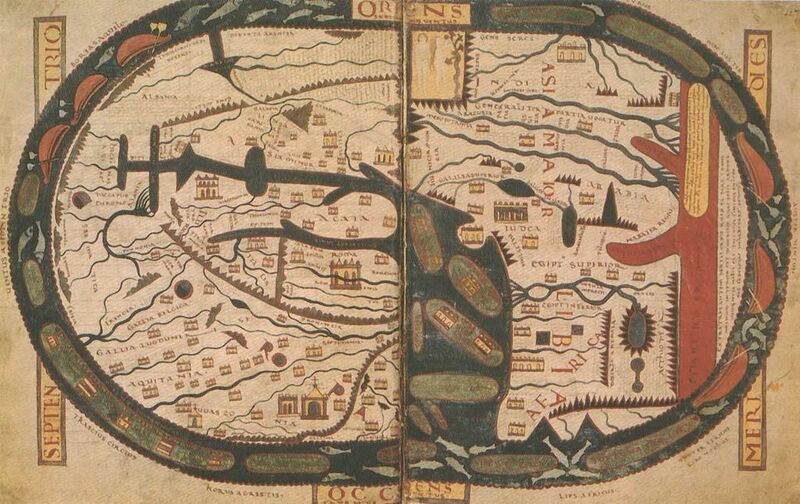 Neither do any of these early (1400s or before) maps seem to show Australia–in other words, the Chinese (and Koreans) were drawing recognizable maps of Africa and Europe before Australia. 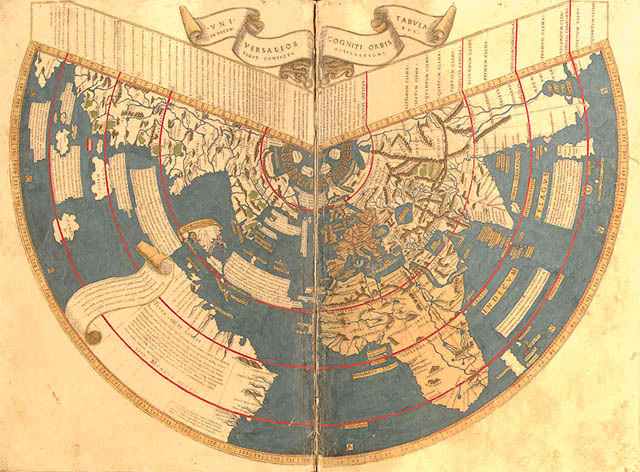 European portolan charts appeared, seemingly ex nihilo, in the 13th century. The portolans used compass directions plus sailing directions to estimate distances between map points, thus producing a revolution in map accuracy. The compass roses are drawn directly onto the map for navigational convenience, as on this “Dieppe map” by Guillaume Brouscon, 1543. Defining exactly who is white is contentious and difficult–so I shan’t. If you want to debate among yourselves whether or not the Irish or Hindus count, that’s your own business. An orthognathic profile, with minimal protrusion of the lower part of the face (little or no prognathism). Retreating zygomatic bones (cheekbones), making the face look more “pointed”. Narrow nasal aperture, with a tear-shaped nasal cavity (nasal fossa). But I am not going to deal with any of these, unless I hear of something like the EDAR gene coding for a bunch of traits. Old racial classifications made use of language groups as stand-ins for racial groups. This turns out to be not very reliable, as we’ve found that in many cases, a small group of conquerors has managed to impose its language without imposing its genetics, as you’ve discovered in real life if you’ve ever met an African or Indian who speaks English. The first known modern humans in Europe (IE, not Neanderthals nor Homo Erectuses,) popularly known as Cro-Magnons and unpopularly known as European early modern humans, (because anthropologists hate being understood dislike sounding like commoners,) lived around 43,ooo-45,000 years ago in Italy. By 41,000 years ago, Cro-Magnons had reached the southern coast of England. D. Our knowledge is incomplete. 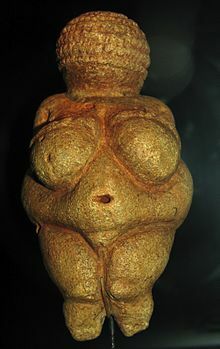 The Cro-Magnons carved the famous “Venus of Willendorf” (we don’t really know if the figurine was intended as a “goddess” or a fertility figure or just a portrait of a local lady or what, but it’s a nice name,) among many other similar figurines, some of them quite stylized. Some people think the figurines look African, with cornrows or peppercorn hair and steatopygia. 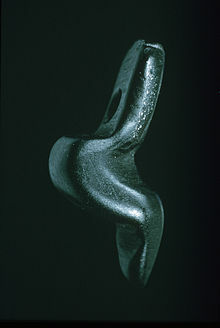 Others suggest the figurines are wearing hats or braids, and point out that not all of them are fat or have large butts. Variations in the KITL gene have been positively associated with about 20% of melanin concentration differences between African and non-African populations. One of the alleles of the gene has an 80% occurrence rate in Eurasian populations. 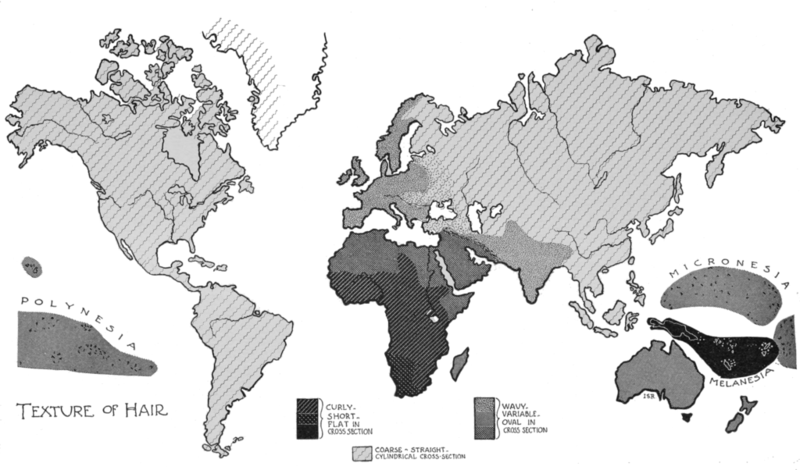 The ASIP gene has a 75–80% variation rate among Eurasian populations compared to 20–25% in African populations. Variations in the SLC24A5 gene account for 20–25% of the variation between dark and light skinned populations of Africa,and appear to have arisen as recently as within the last 10,000 years. The Ala111Thr or rs1426654 polymorphism in the coding region of the SLC24A5 gene reaches fixation in Europe, but is found across the globe, particularly among populations in Northern Africa, the Horn of Africa, West Asia, Central Asia and South Asia. 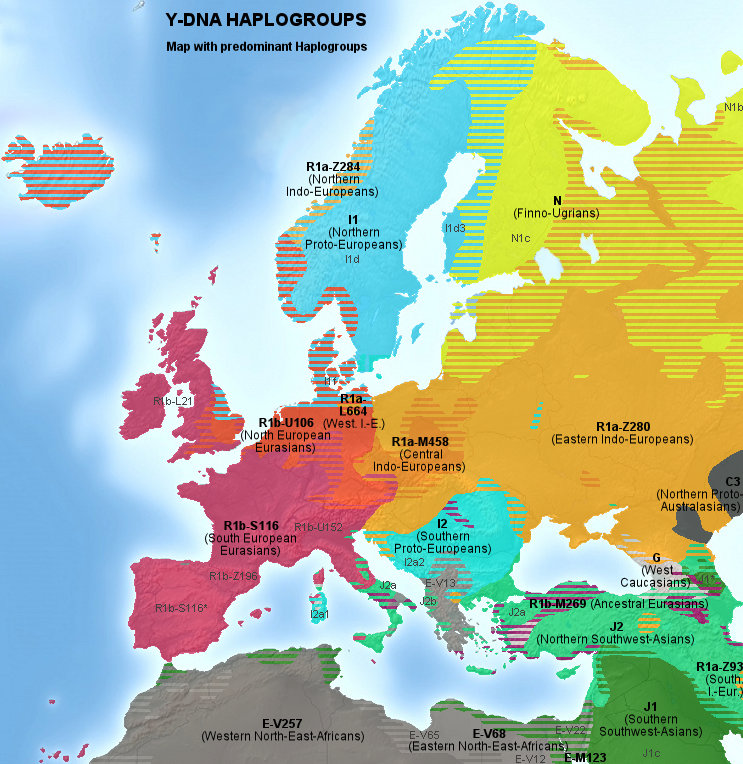 According to genetic studies, Yamnaya Proto-Indo-European migration to Europe lead to Corded Ware culture, where Yamnaya Proto-Indo-Europeans mixed with “Scandinavian hunter-gatherer” women who carried genetic alleles HERC2/OCA2, which causes combination of blue eyes and blond hair. 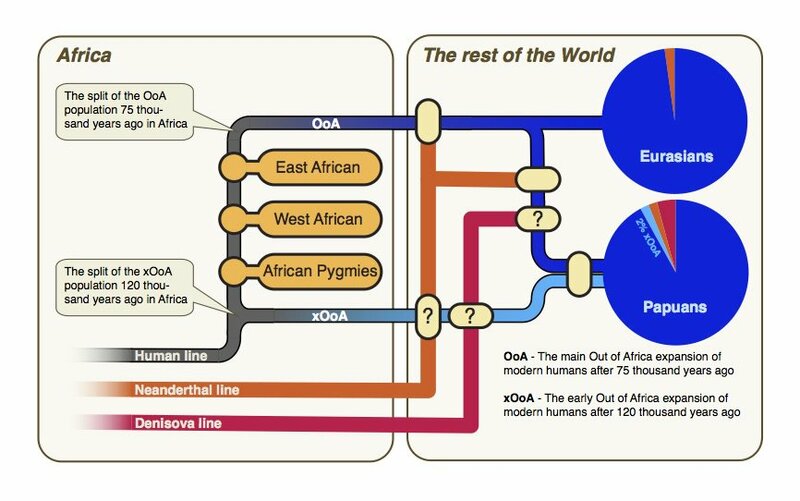 Descendants of this “Corded Ware admixture”, split from Corded Ware culture in every direction forming new branches of Indo-European tree, notably Proto-Greeks, Proto-Italio-Celtic, Proto-Indo-Iranians and Proto-Anatolians. Proto-Indo-Iranians who split from Corded ware culture, formed Andronovo culture and are believed to have spread genetic alleles HERC2/OCA2 that causes blonde hair to parts of West Asia, Central Asia and South Asia. Genetic analysis in 2014 also found that Afanasevo culture which flourished in Altai Mountains were genetically identical to Yamnaya Proto-Indo-Europeans and that they did not carry genetic alleles for blonde hair or light eyes. 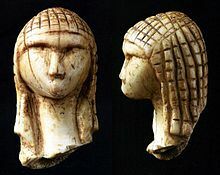 Afanasevo culture was later replaced by second wave of Indo-European invaders from Andronovo culture, who were product of Corded Ware admixture that took place in Europe, and carried genetic alleles that causes blond hair and light eyes. An interesting finding [in Ancient human genomes suggest three ancestral populations for present-day Europeans] is that the Luxembourg hunter-gatherer probably had blue eyes (like a Mesolithic La Brana Iberian, a paper on which seems to be in the works) but darker skin than the LBK farmer who had brown eyes but lighter skin. Raghavan et al. 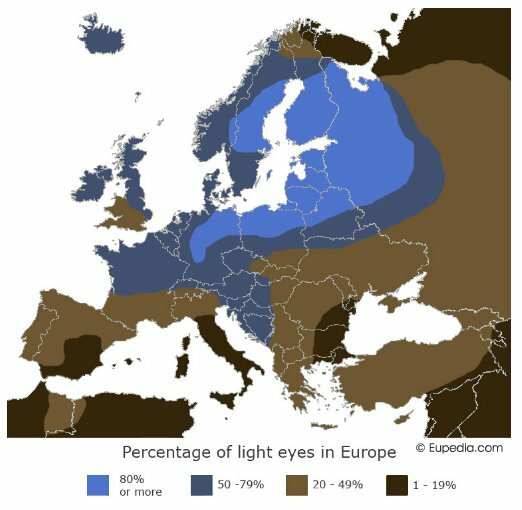 did not find light pigmentation in Mal’ta (but that was a very old sample), so with the exception of light eyes that seem established for Western European hunter-gatherers (and may have been “darker” in European steppe populations, but “lighter” in Bronze Age South Siberians? 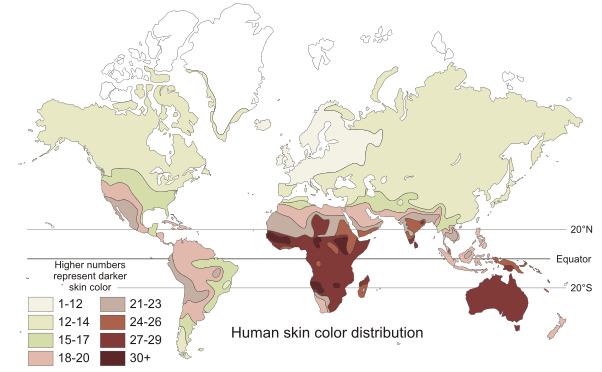 ), the origin of depigmentation of many recent Europeans remains a mystery. 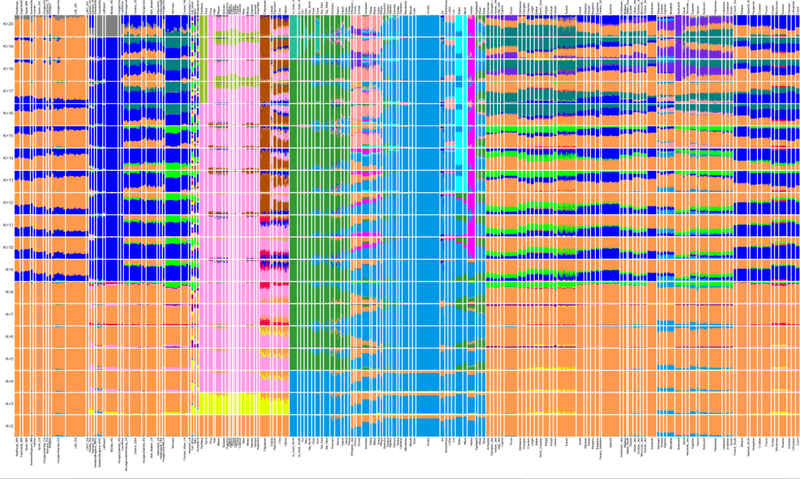 … we estimate that the onset of the sweep shared by Europeans and East Asians at KITLG occurred approximately 30,000 years ago, after the out-of-Africa migration, whereas the selective sweeps for the European-specific alleles at TYRP1, SLC24A5, and SLC45A2 started much later, within the last 11,000–19,000 years, well after the first migrations of modern humans into Europe. In a 2015 study based on 230 ancient DNA samples, researchers traced the origins of several genetic adaptations found in Europe. The original mesolithic hunter-gatherers were dark skinned and blue eyed. The HERC2 and OCA2 variations for blue eyes are derived from the original mesolithic hunter-gatherers, and the genes were not found in the Yamna people. The HERC2 variation for blue eyes first appears around 13,000 to 14,000 years ago in Italy and the Caucasus. 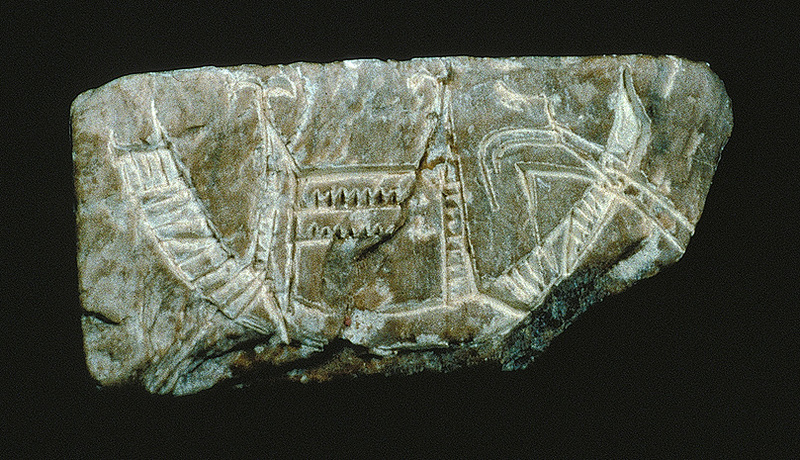 The migration of the neolithic farmers into Europe brought along several new adaptations. 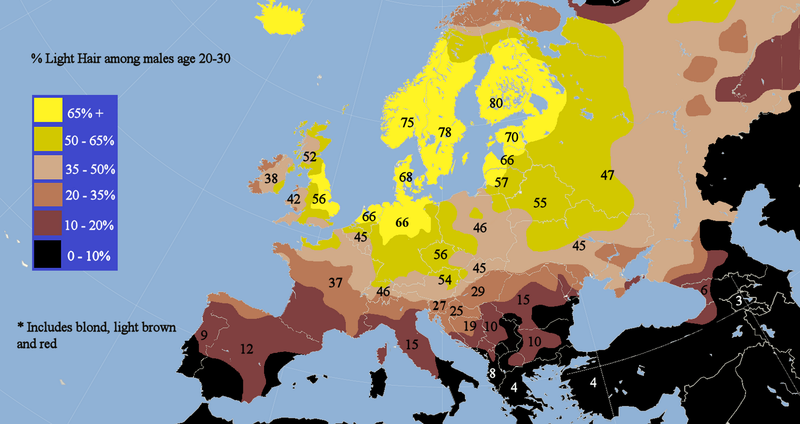 The variation for light skin color was introduced to Europe by the neolithic farmers. After the arrival of the neolithic farmers, a SLC22A4 mutation was selected for, a mutation which probably arose to deal with ergothioneine deficiency but increases the risk of ulcerative colitis, celiac disease, and irritable bowel disease. The genetic variations for lactose persistence and greater height came with the Yamna people. It looks like some of these traits emerged in different populations and later combined as they spread, but they all look like they arose at approximately the same time. Obviously I have neglected red and brown hair, green and hazel eyes, but the genetics all seem to be related.